Seattle Seahawks DT Jarran Reed is being investigated by police from an incident that occurred on April 27, according to reports by Seattle’s KING-TV. The case reportedly remains open without charges having being filed at this point in time. A second round selection in the 2016 NFL draft, Reed really struggled with an overall grade of just 44.2 overall, good enough to rank him 91st among 127 defensive interior lineman. 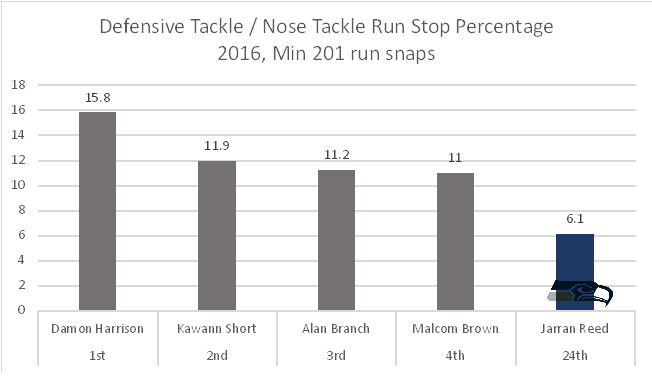 He saw the field for 231 run plays as a rookie and PFF signature stats show that Reed was 24th in the league on run stop percentage among defensive tackles/nose tackles with a stop percentage of 6.1 percent (minimum of 201 run snaps). Stops constitute a “loss” for the offense and include only snaps on run plays.